Domino is proud to present Henryk Górecki‘s Symphony No. 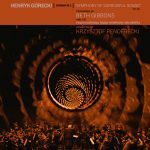 3 (Symphony of Sorrowful Songs) performed by Beth Gibbons (Portishead) and The Polish National Radio Symphony Orchestra and conducted by Krzysztof Penderecki. Henryk Górecki (1933 – 2010) was a Polish composer of contemporary classical music, believed to be the most commercially successful classical composer in recent times, and previous versions of his Third Symphony have sold over a million copies. This performance was recorded in November 2014 at The National Opera Grand Theater in Warsaw as part of an evening of programming that also featured 48 Responses To Polymorphia by Jonny Greenwood (Radiohead) and the world premiere of Réponse Lutosławski from Bryce Dessner (The National). The apparent simplicity of Górecki’s third symphony – its straightforward harmonies and rhythmic regularity – is belied by the score; this is not an easy piece for any of the performers. Dynamic changes happen over vast stretches of time; canons build and interweave; there are sustained stretches in which singer and orchestra have to keep the music hovering, almost still – everything is moving but seems motionless. And the texts themselves bear the same contradictions – simple language and exposed sentiments, beneath which are pain, loss, tragedy and horror. Following an invitation to participate in this performance, Gibbons undertook an intense process that included learning the original text in Polish without speaking the mother language. She worked from a specially-prepared vocal score bearing the original text, a phonetic interpretation, and – crucially – a translation. Typical to form, however, the elusive and iconic artist met and exceeded the challenge. Gibbons’ guiding principle, into which she packed all the technicalities of singing, language, and character, was to engage emotionally with the piece. Her performance alongside the conductor Penderecki (The Shining, The Exorcist) – often called Poland’s greatest living composer – has been hailed as triumphant. Marketing and promotion are key components to leading people to your music. Contact us to find out how we can help you.